Many of our guest room telephones have the option of custom faceplates. We can print your company logo and custom contact numbers to assist your customers with the best service posible. Having Custom Faceplates on a Motel Phone helps to reinforce brand recognition on your hotel telephone. Please contact us regarding your custom faceplates. We can print multicolor custom faceplates with any numbers and information you and your Customers may require. We also provide the following templates to help you create your faceplates. Also we can design custom faceplates for you at a nominal charge. 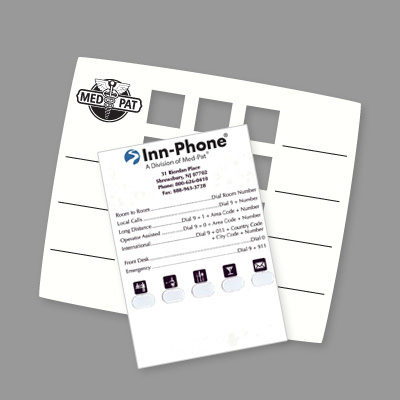 Faceplates allow branding by placing your logo on your Inn-Phone product. Additionally, fast access to services and phone numbers assist your customers and ensure they have the most comprehensive information at thier fingertips. Branding also helps Customers remember your Company Name and logo over competitors.